… what could I say? Charlie has been researching and writing books & articles about whisky since 1981, he insisted on being Patron, who are we to say no? Charlie is a writer whose special subject is Scotch whisky, about which he has published ten books to date, including the standard work on whisky brands, Scotch Whisky and the leading book on its subject, Malt Whisky, both of which were short-listed for Glenfiddich Awards. Whisky: A Liquid History, published by Cassell in 2003 was named Wine and Spirit Book of the Year (2005) by the James Beard Foundation of New York. 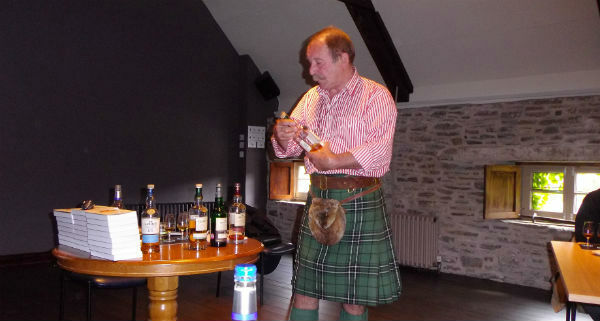 MacLean’s Whisky Miscellany followed in 2004, expanded in 2006 as Whisky Tales; in 2008 he was Managing Editor of Dorling Kindersley’s Eyewitness Companion to Whisky, and in 2009 their World Whiskies. Whiskypedia was published in June 2009. It’s an ongoing thing, we meet up with Charlie here and there during our whisky travels. Its good keeping it “in the family”!